Yet Another Workshop Blog #4: Finished! Some final pics of the new workshop. It took a few months but finally got everything in and set up. After much debate about heating, I decided to go with a 5000W electrical heater, along with a small pellet stove. Living in a rural area I was limited to electric or wood heat. 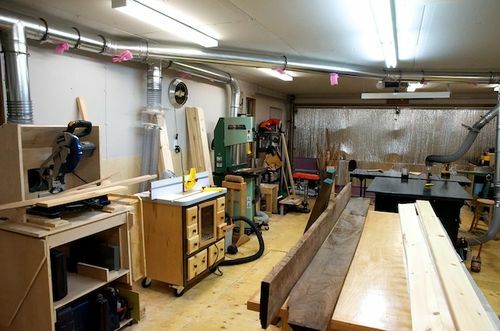 I use the electric heater to bring the shop up to a reasonable temperature and to keep it above freezing at night, and the pellet stove to maintain the temp while I’m working in the shop. Seems to work well so far, we’ll see how well it performs when it is -30… The ducting is 6” quickfit duct from K+B duct; the initial cost was steep, but it allows me to reconfigure the shop if I need to, as well, when/if I move again in a few years it will be easy to take with me. The lighting is less than ideal; I had asked the electrician to put in 8ft banks of fluorescent lights, somehow he translated that to 4’ banks.. I’ve left most of them up but will slowly replace them. Great lighting. That is so important and generally so overlooked. Does that hood work with the miter saw? I been thinking of building something like that. What a nice place to work! I agree about the lighting, the more the better, and you definitely have more. 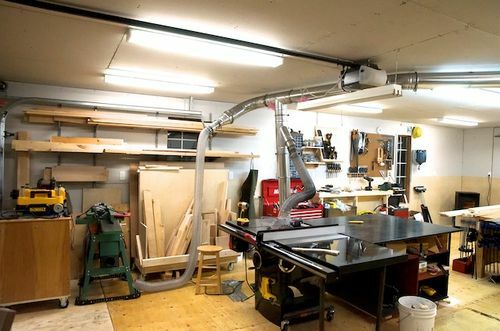 This also looks like a very efficient layout of space, with regards to tools. 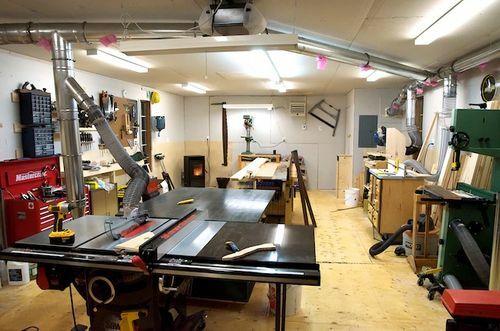 I love that the table saw, assembly/outfeed table, and bench are in the middle, and everything else is up against the walls. That’s basically how I’ve got my shop organized, though, so I may be biased. You said you are using a 5 hp DC. What is the cfm and brand? That is a really nice shop. I am green with envy!!!! Fine lookin set up. wish my shop was that clean. Congrat, it looks like a wonderful shop you have made now. Rob – nice shop. I like the setup. The ducting is nice. You have a really fine workshop. Good work. Rob, that is a great looking shop. I am only able to pry one stall out of our 3 car garage. Would love to have the space you have.